This study considers the historical, cultural, and literary significance of some of the most important Ancient Near East (ANE) texts that illuminate the Hebrew Bible. Christopher B. Hays provides primary texts from the Ancient Near East with a comparison to literature of the Hebrew Bible to demonstrate how Israel's Scriptures not only draw from these ancient contexts but also reshape them in a unique way. Hays offers a brief introduction to comparative studies, then lays out examples from various literary genres that shed light on particular biblical texts. Texts about ANE law collections, treaties, theological histories, prophecies, ritual texts, oracles, prayers, hymns, laments, edicts, and instructions are compared to corresponding literature in the Pentateuch, Prophets, and Writings of the Hebrew Bible. The book includes summaries and reflection questions to help instructors and students identify key points for comparison. By considering the literary and historical context of other literature, students will come away with a better understanding of the historical, literary, and theological depth of the Hebrew Bible. Click here to read a sample chapter, in which Hays compares Genesis 1-2 with creation accounts from Babylon and Egypt. "Christopher Hays's work represents an important contribution to the approach known as 'Scripture in context.' The strength of this book is in its organization, as Hays skillfully builds context from a broad range of Near Eastern materials, each placed carefully within the comparative framework of Scripture. As such, it represents an invaluable resource for the study of biblical as well as cognate literature." 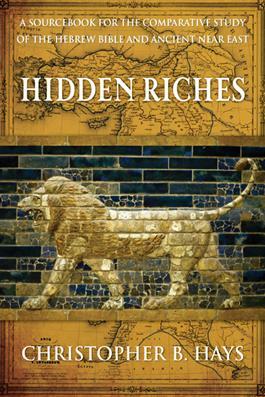 "Hidden Riches is a skillfully curated introduction to comparative study of the Hebrew Bible. Hays provides expertly translated text selections, helpful introductions to each, questions for reflection, and bibliographical suggestions, all of which contribute to a deeper understanding of the Hebrew Bible. Hidden Riches is an ideal textbook for both undergraduate and master's students." "In Hidden Riches, Christopher B. Hays provides an erudite yet accessible treatment of many ancient Near Eastern texts, examining each in relation to comparable biblical texts. But far from exhibiting the 'parallelomania' of yesteryear, Hays's comments take a balanced and well-studied approach, serving to introduce readers to important interpretive issues surrounding these texts in contemporary critical scholarship. The author's astute questions for discussion and suggestions for further reading lead both introductory and more advanced students into the broader world of thought in which the Bible took shape, filling a long-standing lacuna in classroom-oriented textbooks." "This is a most helpful resource for the study of the Bible in its ancient Near Eastern context, since it not only provides the most relevant comparative material, but also critically assesses it and its biblical counterparts. Hays's specialization in both biblical studies and ancient Near Eastern studies has yielded a thorough and reliable tool for students and teachers alike." "This collection of ancient Near Eastern texts for the study of the Hebrew Bible is wonderful! For each ancient Near Eastern text paired with a biblical text, the author provides a very engaging and helpful discussion followed by thoughtful study questions. Ideal—and most highly recommended—for a semester introduction to the Hebrew Bible."